Karen Perry of AAUW High Point with participants. The AAUW High Point Branch formed a partnership with its local YWCA to create the “Money Girls Project” to focus on helping middle school girls ages 10 to 14 gain skills in money management in the areas of earning, saving, budgeting, and spending. A workshop was conducted on Tuesday and Thursday afternoons at the YWCA on Gatewood Avenue in High Point during January and February. The project was funded by the National Girls Collaborative Project. A team of enthusiastic girls listened to a podcast on compound interest, created business cards, toured a bank, and worked on spending exercises. The final session was a bargaining simulation where girls used play money to visit booths and bargain for small items such as flash drives, DVDs, office supplies, games, and make-up. 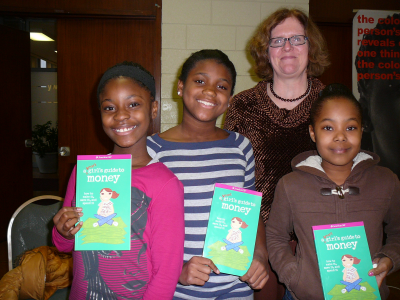 All participants received a copy of the book A Smart Girl’s Guide to Money, by Nancy Holyoke. The workshop was developed following guidelines from the National Girls Collaborative Program which seeks to fund programs for girls which develop skills in the STEM areas of Science, Technology, Engineering, and Mathematics. At the urging of project participants, a second session of the workshop is planned in the Fall.